Gihei was established in 1928. 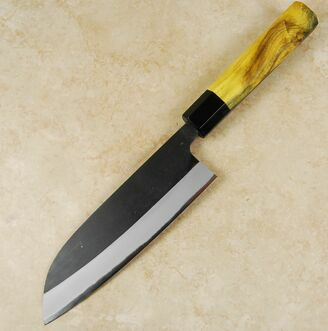 They specialize in the production kitchen knives using some of the most advanced steels around. 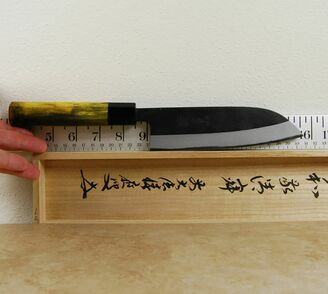 These knives are manufactured in the traditional way, and over the years Gihei has built a very a good reputation based on these principles. We recently started carrying a new line from them made with a more traditional steel, Shirogami 2, or White #2, high carbon steel. 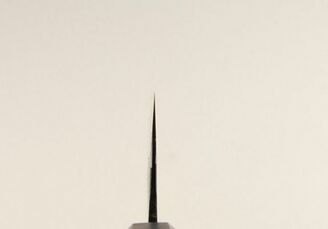 The first kinds we are stocking are the santoku and nakiri styles. These fine blades are hammer forged in the san mai method of awase (cladding), which entails wrapping the inner core of the White #2 steel with a soft iron outer layer. Cladding knife blades with a soft steel makes them easier to manufacture while enhancing strength and wear resistance. 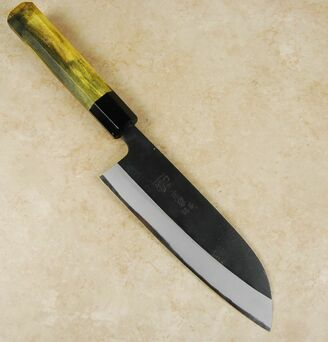 A layer of carbon is formed on the face while forging which is, in the case of this knife, left in place and only removed below the mid-grind point. This adds a lovely rustic look to the knife while further protecting it from corrosion. We are supplying these fine santokus with some of our custom handles to add to the aesthetic value and enhance their ergonomic quality. Please note: the handle you will get is the one featured in the photograph, not the one in the video.